Mechanicsburg’s Francys King stretches her strides to beat a throw out at first base on Friday against Cedarville. Mechanicsburg’s Dylan Hartman tries to send a ball into the outfield with runners on against Cedarville on Friday. 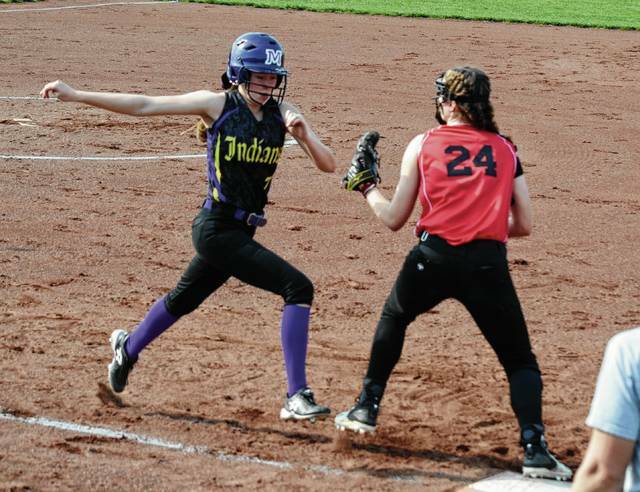 MECHANICSBURG – Mechanicsburg beat Cedarville, 20-0, in five innings of OHC softball on Friday. The Indians were on another level offensively, with Allie Raber going 3-for-3 with a pair of RBI to lead the way. Miranda Lauchard was 2-for-3 with a double and 2 RBI, Jessica Maddux was 2-for-3, Francys King was 2-for-3 and Ceci Link was 2-for-2. King also got the win in the circle. M’burg (2-5, 2-4 OHC) plays at Riverside with games against the Pirates and Indian Lake today. 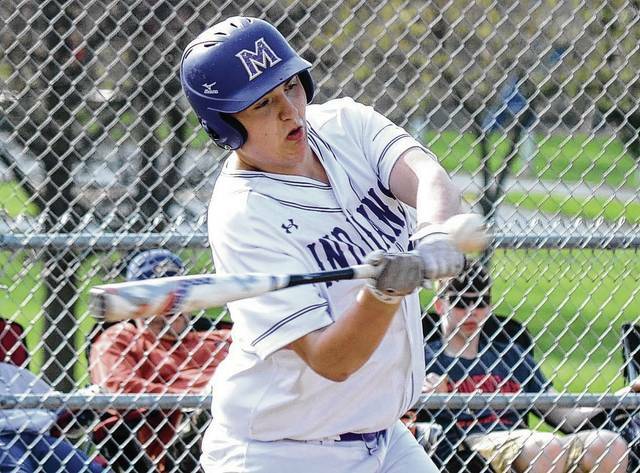 MECHANICSBURG – Mechanicsburg defeated Cedarville, 11-2, in OHC baseball on Friday. Kix Thiel was 3-for-4 with a pair of runs scored, Dylan Hartman was 2-for-4 with 3 RBI and Matt Myers was 2-for-4 with 2 RBI and scored twice for M’burg. Corey Bogan threw a complete game, striking out 11 batters for the home Indians (6-3). Mechanicsburg hosts Ridgedale in a doubleheader today. DAYTON – Urbana defeated Greenon, 9-0, in CBC baseball on Friday at 5/3 Field in Dayton, home of the Dayton Dragons. The Hillclimbers’ offense finally came alive after a hiatus, with Seth Mangus going 3-for-4 with a double and 3 RBI to lead the way. Caleb Peterson was 2-for-2 with a triple and an RBI and Logan Rooney was 2-for-4. Peterson got the shutout win, allowing just one hit against nine strikeouts. Urbana (5-6) will host Kenton Ridge on Monday. WL-S lost the lead late in a 6-2 setback to Bellefontaine in non-league baseball on Thursday. The Tigers took a 2-run lead in the third and held it through five complete. Bellefontaine tied the game on a 2-run double in the 6th by Cole Wisner. Thomas Allen pitched 8 full innings striking out 8 and surrendering one earned run on 4 hits. Ben Hyland suffered the loss giving up 4 runs on 1 hit. The Tigers out-hit the Chiefs, 6-5. Urbana lost to Shawnee, 4-1, in CBC boys tennis. At first singles, Andrew Fansler lost to Daniel Dietrick 6-1, 6-0. At second singles, Bailey Ullah lost to Michael Foley, 6-2, 6-3. At third singles, Abe Angles beat Gabe Andorfer, 6-1, 6-2. At first doubles, Cole Headlee and Trevor Johnson lost to Chris Hile and Tanner Brown, 6-1, 6-2. And at second doubles, Nick Pettit and Hudson Stouffer lost to Bryce Peters and Stef Gaffney, 6-2, 6-2. In jayvee singles, Ethan Burnside lost to Brad Graham, 8-3. Urbana (7-5) hosts Xenia Christian on Monday. The West Liberty-Salem junior high finished first out of 16 teams at the Benjamin Logan Track Invitational Thursday night. Gracie Estes received the Girls MVP award for the meet. Finishing first for the Tigers were Anna McGill (Discus 87-8); Estes (100 Hurdles 17.1, 200 Hurdles 30.57, 200 M 27.3 School Record); Megan Adams (1,600 M 5:38.51) and Katelyn Stapleton (400 M 1:01.38, 800M 2:26.51 both school records). Nick Burden was first in the 1,600m (5:02) and 2nd in the 800m (2:14). https://www.urbanacitizen.com/wp-content/uploads/sites/36/2017/04/web1_FrancysKing041417.jpgMechanicsburg’s Francys King stretches her strides to beat a throw out at first base on Friday against Cedarville. https://www.urbanacitizen.com/wp-content/uploads/sites/36/2017/04/web1_DylanHartman041417.jpgMechanicsburg’s Dylan Hartman tries to send a ball into the outfield with runners on against Cedarville on Friday.